Slough Jets lined up against Sheffield Steeldogs with Andrius Kaminskas in the line up in place of Ales Padelek. After a tense warm up period Brad Watchorn and Callum Pattison came together before even a second had elapse with the Slough player taking the win. The Sheffield player took the win in the next scuffle as Andrius Kaminskas and Andre Payette came together. While those two served their penalties Kamil Tvrdek netted the home team’s opening goal at 8.09 for a 1-0 lead. Sheffield’s Andrew Hirst scored at 11.17 to level up and Lubomir Korhon scored the go ahead goal and the 1-2 scoreline remained at the first interval. The physical edge to the game continued in the second period but with 45 seconds to go to the midway point of the game Slough were back on level terms with Sam Waller firing home from the blue line on the powerplay. Just over 2 minutes later Sheffield pulled themselves back into the lead with Hirst’s second goal, scored while Andrius Kaminskas sat out a cross checking penalty. Korhon’s second at 34.58 ensured a 2-4 scoreline come the end of the second period. 108 seconds into the final period Mindy Kieras scored a powerplay goal to draw the lead back to a goal with a 3-4 score but sensing a way back Sheffield capitalised on Slough’s opening up to try and score again and Greg Wood scored at 44.32 to make it 3-5. Korhon ended his own game personally by collecting a 10 minute misconduct with 9.39 left but while he sat out Sheffield continued their scoring with Hirst netting his hat-trick goal at 52.17 and Craig Elliot concluding scoring at 53.40. Swindon Wildcats played host to the Slough Jets in a midweek league fixture. It took just 208 seconds from the first puck drop for the home team to score their first goal against a short benched Slough team when Mattias Perkkio scored. Slough equalised at their first powerplay chance, 9 seconds into the advantage thanks to Frantisek Bakrlik but after a 5+game penalty to Pavel Gomeniuk for high sticks Perkkio convered the second powerplay offered to the home team at 15.02. Ciaran Long finished from Michael Wales with Gomeniuk’s penalty still being served for the equalising goal shorthaded at 15.23 but with 26 seconds left in the opening period Aaron Nell scored to end the first period 3-2. The home team secured their victory in the middle period with a 4-1 20 minute spell. Jonas Hoog netted first at 24.19 with his strike countered by Bakrlik netting his second at 27.38. Henri Sandvik then stepped forward with a natural hat-trick at 32.35, 34.28 and then on the powerplay at 37.30. Danny Milton took over the Slough net for the final period and Jonas Hoog put one past the young netminder, shorthanded at 42.09. Mindy Kieras pulled a goal back on the powrplay at 47.27 and Bakrlik scored his hat trick goal at 49.50 but that turned out to be the last of the game and Swindon closed out for the win. Slough Jets and Basingstoke Bison met up at the Hangar in a league clash just 4 days ahead of the second leg of the cup semi-final. Slough took the lead at 15.12 when Michael Wales beat Stevie Lyle for the opening goal but the first period ended level thanks to a 17.49 powerplay goal by Joe Rand. The middle period also failed to separate the teams with Rand netting his second at 21.44 to put the visitors ahead and Tony Redmond making it 1-3 at 26.29 but just 15 seconds later Dan Rose fired a top shelf goal past Lyle to make it 2-3 and at 35.03 Wales netted his second, this one on a powerplay at 35.03 ensuring the second period ended tied at 3-3. Joe Miller was forced to leave the game with a 5+game penalty for high sticks at 39.46. Slough converted the Miller major penalty when Ciaran Long scored 1.59 into the period and Frankie Bakrlik made it 5-3 at 44.08 still with the major penalty being served. Dan Davies netted at 47.34 making it 6-3 but the game still wasn’t won. Greg Chambers converted a too many men penalty into a powerplay goal at 51.56, Doug Sheppard netted at 52.27 and with 1.04 left in regulation time Greg Owen scored the equaliser while Pavel Gomeniuk served a delay of the game penalty. Overtime failed to decide the result and it came down to penalty shots. Dan Davies took the first shot and scored, but Jaroslav Cesky did the same for the visitors. Darius Pliskauskas scored the second shot for the home team and Greg Owen was saved by Gregg Rockman. Both Frantisek Barklik and Greg Chambers failed to score the final shots before sudden death and Slough took the points. Blaine Evans took charge and Aaron Nell opened the scoring after 10.53 scoreless but Doug Sheppard was on hand at 16.20 to finish from Adam Calder and Joe Greener and level up the game and with no further scoring the first period ended 1-1. Swindon worked themselves into a lead in the second period but only after Ryan Watt came together with Jaroslav Cesky to teach the home team player a lesson. Michal Pinc scored at 21.55 ahead of Nell scoring his second at 24.20. Pinc made it 4-1 at 26.42 and Doug Sheppard took the visitor’s time-out straight away. Aaron Connolly pulled a goal back with 5.08 left in the period which ended 4-2. Dan Davies netted at 46.21 to bring the game back alive at 4-3 but when Cesky netted at 53.56 he gave his team a 2 goal margin again which they held to the final hooter for full points. 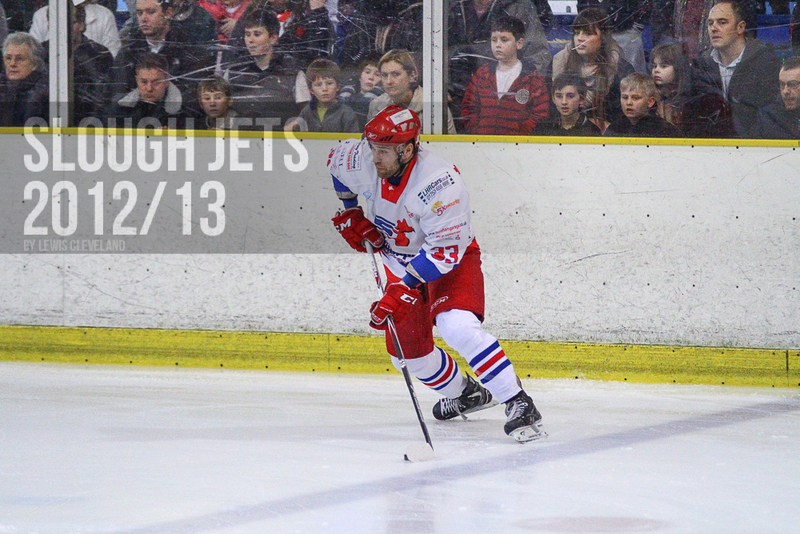 Slough Jets took on the league leading Manchester Phoenix at the Hangar in a return to league action. The teams started out playing another fast paced game and when Slough took the game’s first penalty Manchester were quick to capitalise with James Neil netting a powerplay marker at 14.06. Slough killed the second powerplay but Manchester held the lead until the interval. 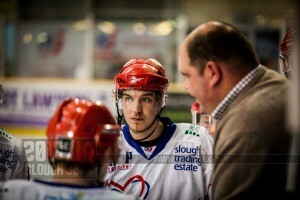 It took just 68 seconds into the second period for Slough to equalise when Adam Calder netted a powerplay goal. Manchester went back ahead soon after though with a shorthanded goal from Marcus Kristoferson at 29.08 and despite a high shooting period it ended a 1-1 with Manchester continuing to hold the lead. Slough powered hard in the third period and while Manchester made the most of this by keeping Gregg Rockman busy Joe Greener levelled the game at 49.46. Doug Sheppard scored an unassisted goal at 55.11 to give Slough their first lead before the game was stopped following an injury to Manchester’s Harrabin required the ice to be resurface. Slough’s Adam Calder took advantage of a late empty net to make it 4-2 and secure the points. Manchester Phoenix made their final regular season trip to the Hangar without achieving victory in the Slough Jets home rink in the season so far. Both teams started the game offensively while Manchester upped their physical play from their two previous visits to the Hangar. After 15.05 the deadlock was broken when Greg Wood scored for Manchester but at 18.50, on the powerplay, Jan Melichar netted to make it 1-1. Manchester scored with 6 seconds remaining in the period to take a lead to the interval. The visitors secured a valuable lead in the second period as Adam Walker scored at 22.55 and Wood netted his second at 27.20. Despite managing more shots than their opponents Slough failed to score in the middle period and Manchester enjoyed the second interval three goals ahead. The final period saw the lowest scoring chances but when Ryan Watt converted a powerplay and pulled a goal back for Slough at 51.31 he re-juvinated the home side. The pushed hard and Peter Poljacek drew the score back to a single goal margin at 56.39. Slough pulled the netminder at 59.21 and called their time-out with 12 seconds remaining but the visitors managed to hold on for their first points at the Hangar.